Photograph courtesy G W Sharpe D5009 in what appears to be almost ex-works condition awaits departure from Birmingham New Street on June 30th 1962. When compared to the first examples of the class, this machine, along with D5008, has only four ventilators on the top row, instead of five found on other early examples. The seventeen year career of D5009/24009 commenced with just over two years on loan to Hither Green before transferring to the London Midland Region and finally the Scottish Region. March 1959 to Hither Green (73C) on loan. May 1962 to Crewe South, then Crewe North (5A). November 1963 to Willesden (1A). January 1964 to Crewe (5A). December 1965 to Bletchley (1E). August 1975 to store & reinstated to Haymarket September 8th 1975. May 1976 to store (unserviceable). 24009 was stored at Carstairs from May 1976 to August 1977, before moving to Doncaster during August 1977, and being scrapped by the last week of November 1977. Movement: 24009, 24128, 24147 Carstairs - Doncaster Works (via ECML) September 15th 1977. Noted Eastleigh Works August 1961. Noted Derby Works June & July 1962. Noted Derby Works June 1963. Noted Derby Works July 1964. Noted Glasgow Works June 1974. 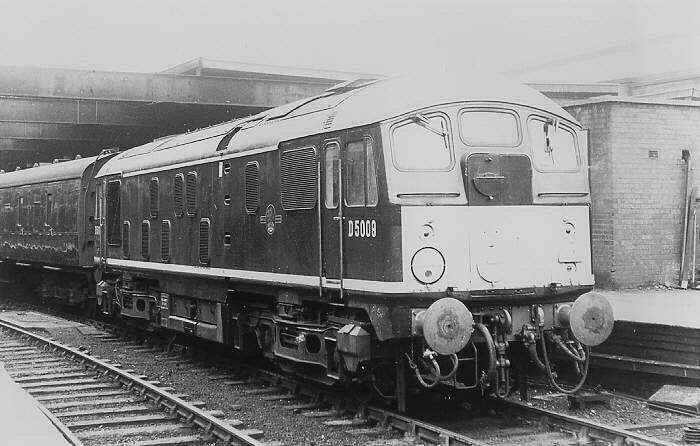 D5009 was one of fifteen Type 2s loaned to the Southern Region pending delivery of the BRCW Type 3s. On July 3rd 1959 D5001 & D5009 were noted on an educational excursion routed via the East Putney line bound for the SE Division. Similar educational excursions were run during July to Southampton & Portsmouth, via Eastleigh, again using pairs of Type 2s. Condition August: green livery with frame level stripe, full size fuel tank, full size water tank, no blanking plates fitted, hand/footholds present, cantrail level water filler cover fitted, ridge sided sandboxes, two-rung bogie mounted footsteps, side ventilators 3/4 BIS side, 4/4 non-BIS side, engine exhaust in original location. A football match between Dartford & Bristol on November 25th 1961 saw two eleven coach specials run. The second one ran with D5013 & D6573 as far as Kensington where steam locomotive 6960 took over. More interestingly the first ran with D5009 & D6523 throughout, making the journey via Clapham Jcn, Salisbury, Westbury and Bath. Condition June: green livery with small yellow warning panels, square upper corners, headcode disc brackets fitted (for use with SR six disc headcodes), full size fuel tank, full size water tank, no blanking plates fitted, hand/footholds present, ridge sided sandboxes, two-rung bogie mounted footsteps. On March 23rd D5005 & D5009 were working a demolition train at Olney, Northamptonshire, the wagons containing many parts from the station and the yard. Condition March: green livery with small yellow warning panels, square upper corners, warning panel covers frame level stripe, headcode disc brackets fitted (for use with SR six disc headcodes), full size fuel tank, shortened size water tank, no blanking plates fitted, hand/footholds present, ridge sided sandboxes, two-rung bogie mounted footsteps, engine exhaust located above engine room. Photograph courtesy Tony Sayer Almost a decade has passed and 5009 is now seriously in need of a classified repair. 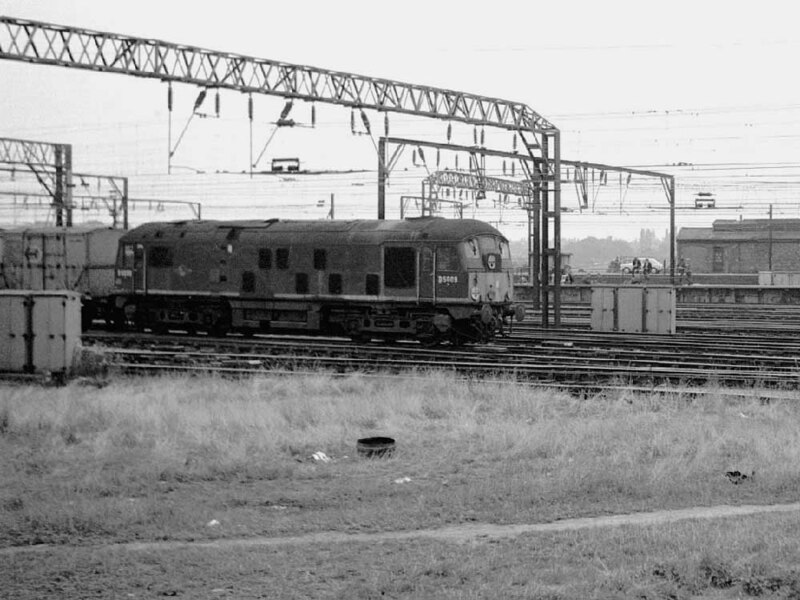 Seen here at Crewe on August 15th 1969. Condition June: green livery with small yellow warning panels, square upper corners, headcode disc brackets fitted (for use with SR six disc headcodes), full size fuel tank, shortened water tank, most bodyside valencing fitted, no blanking plates fitted, hand/footholds present, ridge sided sandboxes, two-rung bogie mounted footsteps, engine exhaust located over engine room. Condition June: blue/yellow livery, yellow livery applied to roof gutter, gangway doors sheeted over, headcode discs centered on cabfront, headcode disc brackets fitted (for use with SR six disc headcodes), full size fuel tank with circular gauge fitted, shortened water tank, bodyside valencing removed, no blanking plates fitted, hand/footholds plated over, ridge sided sandboxes, two-rung bogie mounted footsteps. 24009 was Glasgow's last repair of one of the early Class 24 build, during May & June 1975. Within a month many Scottish Class 24s were placed into store including virtually ex-works 24009 during August. Fortunately 24009 was quickly returned to service, being noted as an exhibit at Carlisle Open Day on August 30th. Unfortunately despite its recent overhaul it did not remain in service long enough to justify the cost of its overhaul. 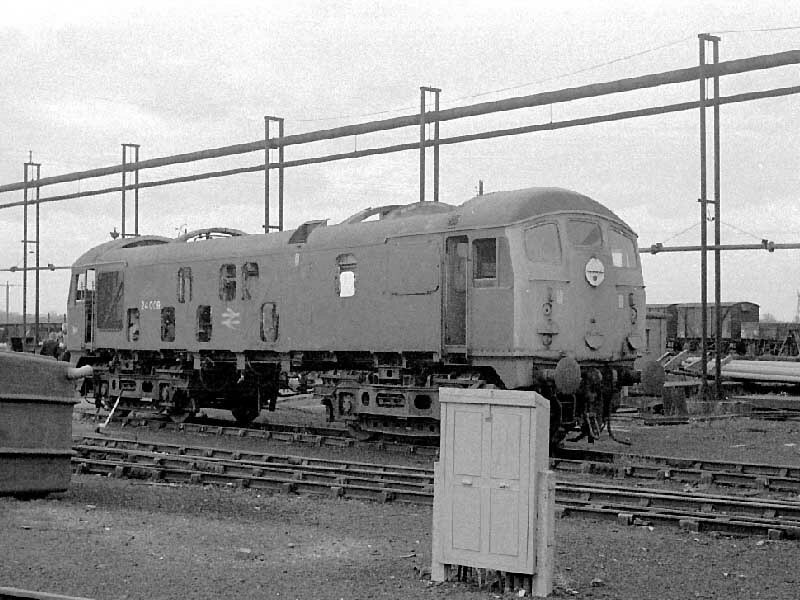 The twenty original BR Sulzer Type 2s built by Derby as part of the Modernisation Plan were mostly retired during 1975, but it would fall to 24009 to be the last of this group to be retired, during July 1976. 24009 was stabled at Perth on October 7th. 24009 was noted outside Polmadie shops on January 3rd. Photograph courtesy Tony Sayer On a dull November 6th 1977 24009 stands stripped at the back of Doncaster Works, just a bodyshell & bogies for the cutters torch. The cab front still carries the headboard brackets unique to the pilot batch, and the centre headcode discs are now placed centrally on the cab front, a sign of a repair carried out at Glasgow. Condition Final: blue/yellow livery, yellow livery applied to roof gutter, gangway doors sheeted over, headcode discs centered on cabfront, headcode disc brackets fitted (for use with SR six disc headcodes), blanking plates fitted, hand/footholds plated over.